Has a wonderful day on Thursday digging with Ogbourne St Andrew History Group, who with the help of a team from Cranfield University led by Karl Harrison are investigating a medieval site. They welcome volunteers even if they have never dug before. We were very lucky with the weather , and the site is in a lovely quiet spot, there were even cakes laid on at the breaks – what a treat on a dig! The site is a medieval agricultural building – at least that’s what’s thought so far. We were clearing the topsoil to expose the remains of a collapsed/robbed flint & stone building wall, on Friday they’re hoping to clear the rubble to get a better understanding of exactly where the wall is and also hopefully find stratified dating evidence. 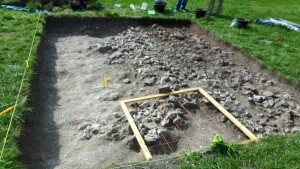 Compared to some sites there weren’t huge numbers of finds, but we did find bone, sheeps teeth, pottery, glass and nails. The bit I helped clear is at the right side of this trench, to the left you can see the rammed chalk floor that was inside the building.